I am a Biologist from "Universidad de Guayaquil" (Ecuador) with a MSc degree in Environmental Sciences from IHE Delft, Delft (2007). In between my BSc and MSc, I gained professional experience in environmental research and consultancy in my home country. I have worked at the Aquatic Pollution Area of the National Institute of Fisheries (INP); where I participated in monitoring campaigns in rivers and the sea, performed water quality analysis and developed bioassays with hydrocarbons. Later I worked at Efficacitas; an environmental consulting firm, taking part in several Environmental Impact Assessments for different productive sectors of my country. Working at Efficacitas gave me the opportunity to expand my expertise and to see the environment in a more holistic way since I was working with a multidisciplinary group of professionals which was definitely interesting and challenging. After finishing the Master at IHE, I was interested in complementing my previous knowledge, thus, I developed an internship at Deltares (WL Delft Hydraulics) in the Marine and Coastal Department for a R&D project, as part of the programme “Building with Nature”. Afterwards, I worked as a research student for an EU funded project “Alexandria Lake Maryut Integrated Management” (ALAMIM) at IHE Delft. Desmit, X., Alvarez, G., 2008. Long-Term Trends in Phytoplankton and Related Parameters in the North Sea. Marine Ecology and Policy Analysis, WL | Delft Hydraulics, Delft, The Netherlands (Poster). Alvarez, G., van Griensven, A., Goethals, P., Mynett, A., Aquatic macroinvertebrates as bioindicators for the assessment of the quality of the Guayas River Basin (Ecuador). Ecological Informatics Conference, Ghent, Belgium, December, 2010 (Oral presentation). Alvarez, G., van Griensven, A., Arias-Hidalgo, M., Mynett, A., The use of bioindicators to assess the ecosystem health of Abras de Mantequilla wetland. SWS Conference (Society of Wetland Scientists), Prague, July 2011 (Oral presentation). My PhD research is oriented to design and carry out an environmental monitoring and assessment for "Abras de Mantequilla" wetland (RAMSAR site 2000) in Ecuador, with the subsequent application of metrics and ecological models to understand how this tropical wetland system works. The general aim is to understand the relations between abiotic and biotic variables by exploring the behaviour of the water quality and food webs; from plankton to fish communities and relating this with the habitat availability. Abras de Mantequilla is a tropical wetland located in the “Guayas River Basin”, the most important river basin in the Coastal Region of Ecuador, given that round 70% of the national crop is produced in this basin. However, during the last decade, the basin has faced an increase in environmental problems (intensive agriculture; reduction of forest areas and hydroelectric projects). Abras de Mantequilla was also selected as the South-American case study of the WETwin project (EU funded). The project included seven study areas located in Africa, Europe and South-America (See below links WETwin 2010, 2013). In order to evaluate the current ecological status of the wetland, aquatic communities (Plankton, macroinvertebrates, fishes) and associated physical and chemical variables in water quality and sediments have been sampled in 2011 and 2012. Relations between these biotic and abiotic variables have been explored using statistical methods. Results from both sampling campaigns confirm its remarkable function as a habitat for aquatic communities, since higher densities of organisms were reported in the wetland compared with its river inflow. 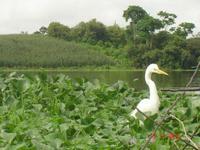 Moreover, the wetland can be considered a valuable area of breeding and reproduction for fish communities. An integrated modelling approach (water quality, ecology and habitat analysis) is a key component of my research. For this purpose, DELFT WAQ-ECO and HABITAT, both softwares from DELTARES are being applied. 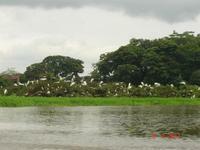 The output of this research will contribute to understand this tropical river–wetland system. Present ecological status and scenarios will be evaluated with the final aim to support wetland stakeholders (local communities, experts and government authorities) in developing future monitoring activities and environmental management plans for the wetland and upstream areas.